Years: Mid 1980's - ? 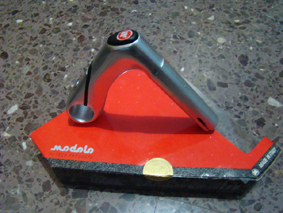 Business starts in 1952 by Adamo Modolo in Santa Lucia di Piave, Italy with the production of steel brake levers. After becoming well known for bicycle brakes and brake levers their focus in the 1990s switched over to bars and stems and later again to wheel sets. Modolo's philosophy is to combine italian flair with innovative development in bicycle components.